In an amazing move, the Federal Reserve cuts interest rates by 3 basis points which is the biggest cut since 1984 during an unscheduled meeting. This changes the interest rates to 3.5%. This decision is obviously a panic move by the Fed in response to the falling stock market and could have been done to prevent a credit crunch. 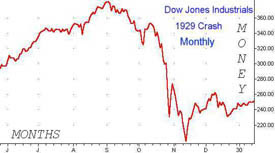 Imagine a stock market crash mirroring the 1929 crash on top of a housing crisis. It would certainly send the world into another Great Depression. However, the cut in the rates does not solve the biggest problem facing the US economy now. It is a liquidity crunch from banks stuck with CDOs that no one in the right mind wants to buy. No matter the grades of these CDOs, these financial instruments are the equivalent of radioactive matter. This means that banks will be cutting down lending, becoming more conservative and wary of each other because some banks have more CDOs than others and some of their peers have not declared their holdings and exposure to this widening sub-prime crisis. It would not do to lend money to another bank only to discover that the other bank has huge CDOs exposure. So banks will less willing to lend to each other and this crisis of confidence will spread to other companies. Could your company be extending credit to a company with investments in CDOs? The invisible hand of a market economy has failed in this case, so there is an urgent need for the governments of the world and central banks to come together and buy over these CDOs. Open the books of all the major banks for a start and book the losses of the lower grade CDOs to the banks (all the ninja loans- no income, no job or assets), take over half or the whole CDO portfolio of the bank using the central bank of the domicile country. Move to the next tier of banks and repeat. If the losses being booked to the banks are big enough to impair the ability to lend, the sovereign countries' funds like those in Middle East (who are earning a pile from high oil prices) and in Asia can be sounded out for investments like what happened with UBS and Citicorp. At a stroke, this removes the uncertainty of how much CDO exposure individual banks have and it frees up the banks to do the most essential task in the economy- providing credit to individuals and companies. These CDOs that central banks take over will not be bad loans and again because they are the central bank, the central bank or Federal Reserve can set a separate fixed interest rate on these housing loans in their CDOs so that these loans can be serviced without the households being unduely burdened. Ban further issuance and transfer of CDOs unless they are sufficiently tweaked so that there is oversight by the local regulatory authority. I don't know whether this scheme will work, but it beats just cutting interest rates which doesn't solve the root problem of a looming liquidity and confidence crisis in banks and more defaults from CDOs. For the ordinary investor like me in this period, there is only one word- diversify!